Deeper clean: Grout is a porous material that becomes discolored as a result of soaking up dirt and spills over the course of several months or even years. Professional equipment delivers a deeper clean than a toothbrush and some elbow grease could ever hope to match. Protective sealant: The beautiful results of professional tile and grout cleaning are designed to last for months thanks to the post-clean sealant the technician applies. This helps make grout more spill- and stain-resistant, thus prolonging that just-cleaned look with no extra effort on your part. Ease: Tile and grout cleaning by hand is a painstaking, messy and uncomfortable process. Scrubbing each and every inch of grout with a toothbrush while on your hands and knees is not exactly a relaxing way to spend your Saturday afternoon. With professional tile and grout cleaning from Rainbow International®, you can go about your day as usual and let the cleaners do their job quickly and thoroughly. Exposure to environmental elements: Water, dust, soot, dirt and spills that come in contact with porous grout eventually take their toll and cause the grout to stain. Certain grout properties: Some types of grout are more porous than others, meaning they are more susceptible to staining. Mildew: Bathroom tiles are subject to high levels of moisture and, more often than not, inadequate ventilation. This allows mold and mildew to grow on the tile and porous grout surfaces. Soap scum: This accumulates on the grout as minerals in the water combined with poorly rinsed soap settle and dry. Clean small areas by hand if spills occur and sporadically discolor the grout. 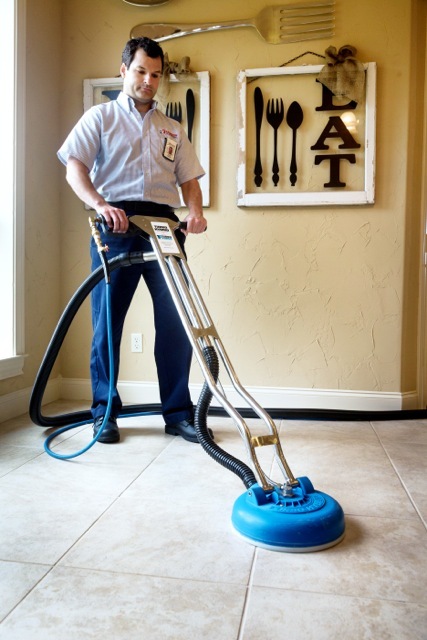 Vacuum or sweep before mopping the kitchen or bathroom floor to reduce the presence of dried out debris. When this debris becomes wet, it could get into the grout and stain it. Rinse the floor with clean water after mopping with detergent. Avoid using bleach or other hard chemicals on the tile that could break down the professionally applied sealant. Wipe down shower tiles after use to reduce moisture that leads to mold and mildew. Rinse other tiled bathroom surfaces after washing to reduce soap scum buildup. If you need tile and grout cleaning in your home, call the professionals at Rainbow International today to schedule a free consultation.